Editors Note: There is a photo and a report associated with this press release. In a recent survey conducted by Ipsos Reid on behalf of Visa Canada, 52 per cent of Canadian parents with children aged 5-16 found back-to-school preparations to be stressful for them and their families, second only to the Christmas or winter holiday season. 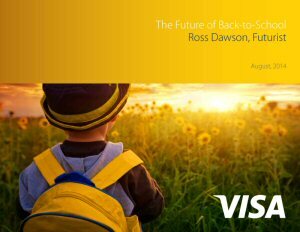 With an eye on the future, Visa also explored how tomorrow's technologies and innovations may address the challenges presented during the busy back-to-school period. Visa commissioned a report by internationally-renowned futurist Ross Dawson who identified a number of innovative technologies that may exist by 2024 to help ease the stress during this annual time period. In his report, titled The Future of Back-to-School, Ross Dawson highlights these futuristic innovations through colourful vignettes, such as at-home scanners that measure children's clothing sizes and systems that automatically allow for purchase and delivery in a timely fashion, or family-focused and streamlined ordering of nutritious groceries, making planning for school lunches a breeze - all purchased using authentication of unique voice patterns. Of all the innovations proposed, around two-thirds of parents are interested in technologies that: enable immediate downloading of required reading materials; provide recommendations for after school activities based on a myriad of factors; provide a spending analysis of back-to-school shopping and its impact on overall family finances; and create grocery lists that are automatically generated based on preferences and dietary restrictions and appear at your doorstep. Parents said that stressors during the back-to-school season include spending money on new supplies and clothing (58 per cent), adapting to new sleep/home routines (48 per cent), having to go out to buy new supplies and clothing (44 per cent), helping with homework (42 per cent), arranging school lunches (39 per cent) and transportation to and from school (33 per cent). While spending money to prepare kids for school was stressful for most parents, a majority are interested in an innovation that provides a simple but thorough visual analysis of all back-to-school spending and the impact it has on the family budget. A further 8 in 10 parents think this innovation is likely to exist in 2024. 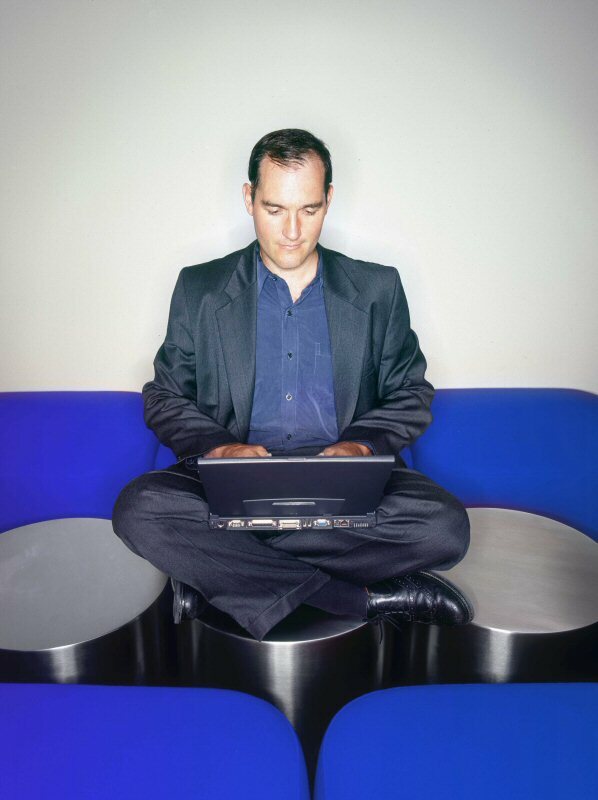 "At Visa, we expect progress in technologies over the next decade to deliver convenient and simple solutions, many of which will be underscored by payments innovations that make everyone's lives a little easier," says Brian Weiner, Vice President, Product and Strategy at Visa Canada. "The ideas presented in this report represent the potential for technology and payments innovation to alleviate stress and give people time back to focus on what matters most to them." The Ipsos Reid poll was conducted on behalf of VISA Canada between August 7 to 15, 2014. For this survey, a sample of 1020 parents of children aged 5 to 16 from Ipsos' Canadian online panel was interviewed online. Weighting was then employed to balance demographics and political composition to ensure that the sample's composition reflects that of the population according to Census data and to provide results intended to approximate the sample universe. A survey with an unweighted probability sample of this size and a 100% response rate would have an estimated margin of error of +/- 3.5 percentage points, 19 times out of 20, of what the results would have been had the entire population of parents in Canada been polled. All sample surveys and polls may be subject to other sources of error, including, but not limited to coverage error, and measurement error. Visa is a global payments technology company that connects consumers, businesses, financial institutions, and governments in more than 200 countries and territories to fast, secure and reliable electronic payments. We operate one of the world's most advanced processing networks - VisaNet - that is capable of handling more than 47,000 transaction messages a second, with fraud protection for consumers and assured payment for merchants. Visa is not a bank and does not issue cards, extend credit or set rates and fees for consumers. Visa's innovations, however, enable its financial institution customers to offer consumers more choices: pay now with debit, pay ahead of time with prepaid or pay later with credit products. For more information, visit corporate.visa.com and @VisaNewsCA. Ipsos Reid is Canada's market intelligence leader, the country's leading provider of marketing and public opinion research, and research partner for loyalty, forecasting and modeling insights. Ipsos Reid's marketing research and public affairs practices offer the premier suite of research vehicles in Canada, all of which provide clients with actionable and relevant information. To learn more, visit www.ipsos.ca. Ross Dawson is globally recognized as a leading futurist, entrepreneur, keynote speaker, strategy advisor and bestselling author. He is Founding Chairman of four companies: international consulting and ventures firm Advanced Human Technologies, futures think-tank Future Exploration Network, leading events company The Insight Exchange, and online start-up Repyoot. As a futurist he follows trends, delves into technological and social developments, studies the human systems in which we work, and applies structured methodologies to provide glimpses into what might come to pass in the future.